Hosted Telephony, sometimes known as Hosted VoIP, is a Unified Communications solution that does not use hardware based in your business premises. This means that your business telephone system is hosted in the cloud instead. You make and receive calls using IP Handsets, mobiles or other devices, and the voice traffic is carried over an internet connection which in turn is connected to data centre sitting within the cloud. What are the business benefits of moving to a Hosted Telephone System? With Hosted solutions, you are protected in the event of a disaster. Calls can be redirected to any location or device as long as you have access to the internet. So if one site goes down, it can still be business as usual for staff and customers alike. Hosted systems work on a pay per licence basis. This means scaling up your operations is as simple as purchasing new licences. A main driver for embracing Hosted Telephony is that it is a perfect enabler of Unified Communications, meaning you can combine several different forms of communications such as data, voice and video, across multiple devices and get them to work in unity as a single solution. This makes your workforce more mobile, adaptable and competitive. Companies who prefer the idea of removing physical hardware from sites and managing things remotely are rapidly moving towards this form of telephony. Hosted Telephony is also perfect for companies that don’t have a PBX in place already, and are looking for a minimal capital outlay. In addition, having your telephony hosted in the cloud means no physical maintenance issues related to an on-premise PBX. It means an easy to manage system which is often provided as a fully supported service should you need extra resources. Buying a new business phone system can be expensive in terms of the initial outlay, and many companies put off upgrading their infrastructure for this reason. With Hosted, the initial expenditure is limited as there is little hardware to invest in, especially when it comes to a PBX, which is no longer needed. Ongoing costs can easily be planned for due to the pay per licence nature of the solution. No matter how your employees choose to work- from home, from their mobile device, from the office, via hot-desking- everyone should be able to connect to your hosted business communications solution easily and flexibly, via the internet. Workers can access all the tools that office based employees have access to, such as IM, Voicemail, Email, Video Conferencing and much more. Your mobile workforce can adapt to new business scenarios quickly and without interference to their working day. All of the features and productivity-boosting applications available with an on-site PBX are also available with our Hosted solution. Call transfers, pick-ups, diverts, hunt groups and much more- configuration is easy and quick to carry out. Workers can collaborate easily and efficiently and in a number of ways, depending on their working patterns. Solution IP are Bristol based experts in both Hosted and PBX based telephony. We can talk you through all the benefits of moving to Hosted, and help you determine whether or not it is the right approach for your company. 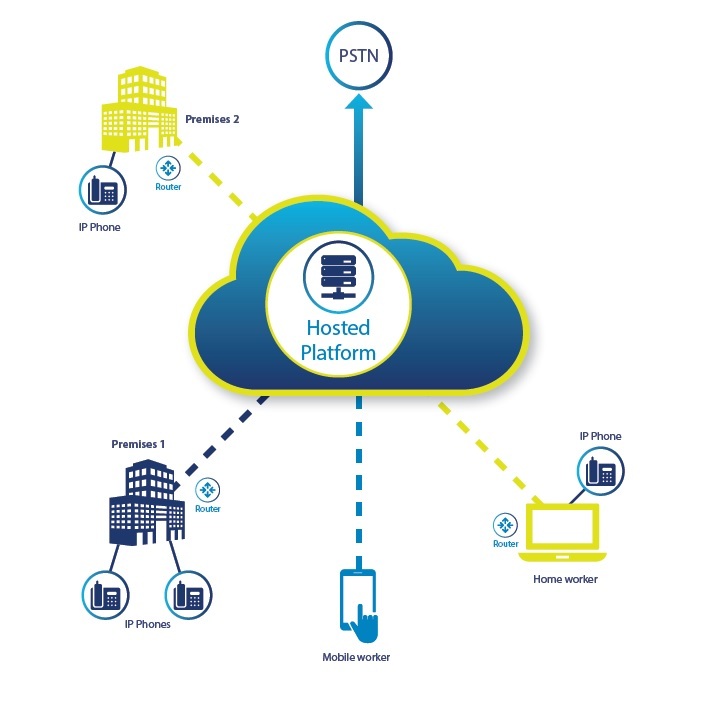 In this instance, the telephone system is hosted centrally in the cloud, which in turn connects to the PSTN. The increasing availability of fast business broadband and improved connectivity across the UK is encouraging the trend towards Hosted Telephony. Other users are able to connect to the system via mobile or home internet connections, and use softphone applications and headsets, or IP Handsets to make and receive calls. It is extremely easy to connect other branches to the hosted system, and having a centralised platform from which to manage everything ensures consistency and reliability when it comes to internal and external calls and business communications. Interested in a Hosted Telephone System? Get in touch with one of our Specialists today.